There are further earthworks and traces of buildings to the South East of the church, some of which may have been connected to the castle, and some of which may be from a much earlier date. The raised earthen mound on which the castle stands probably dates from the same period as the remains of ditches to the South and the East of the castle. These may have been built by Godard de Boyville when he was granted the manor in 1134. Around 1240, the manor passed to the de Hudlstons, with license to crenellate the manor house at ‘Millum’ being granted by Edward III in 1335. It’s from this period that walls of around 5 to 7 feet remain in many parts of the castle. The castle was captured and slighted by Parliamentary forces in 1644, with subsequent repairs being made in the 1670’s. A print dated 1739, shows the site occupied, but in disrepair. The manor in which Millom Castle stands, was held by Earl Tostig up until 1066. Tostig held in excess of two hundred manors up until the Norman invasion of 1066, when he died in the battle of Stamford Bridge attempting to wrestle the English throne from his brother Harold. In all likely hood, he would have had his lands confiscated after the Norman invasion as he was not open to Norman influence in England. Above. Beautiful arched windows with small amounts of tracery still visible. Above. View of the upper storeys of the castle showing areas of robbed stone. Above. Internal doorway with chimney above. Above. Internal view of the kitchen area. Above. Internal view of wall showing holes for floor supports. Above. Bricked up window, interior view. Above. External view of the curtain wall. Above. The much altered gatehouse. Above. External view of the kitchen block. Above. Portion of wall on the boundary with the church. Above. Looking along the still wet moat bordering the church yard. Above. The only decent floor plan of the castle that I could find. I am supose to be related to the Huddleston's who lived in the Millom Castel. I have not proved this, I have a Huddleston 3rd great grandmother [maiden name]. Mathew, is it ok if I put your Millom Castel pictures in my pictures? Thank you for the courtesy of asking. Of course it's ok to use any of the Millom Castle photos, all that I ask is that if you're going to place them on a web site, that you place a text credit beneath for me. I read from your post that this castle is privately owned and part of a farm, do you have any idea how I could get in touch with the owners? A friend of mine is a Huddleston decedent and would like to hold reunion on this site with his family. i am a Huddleston i live in Michigan. 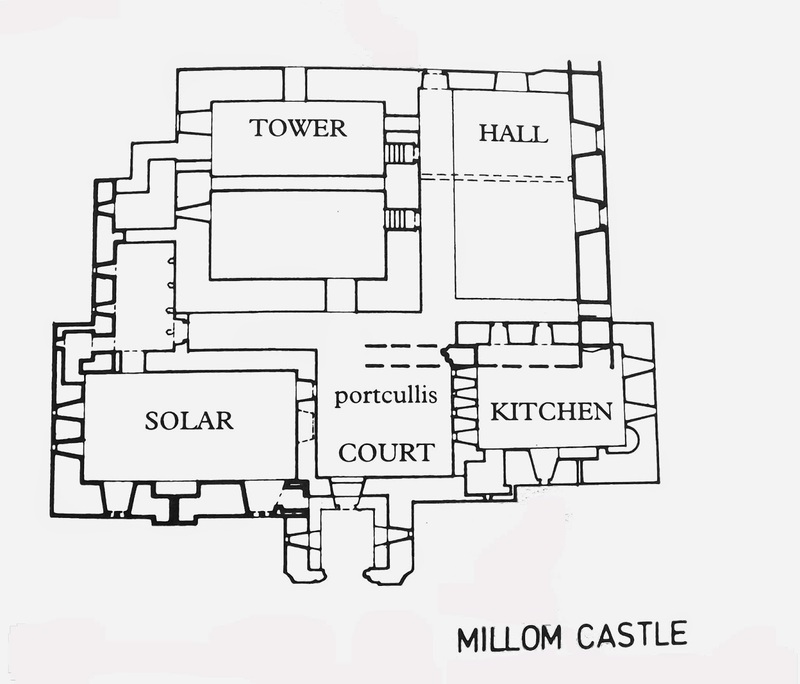 i just now realized that i am related to the Huddlestons that own Millom castle. is the editor of the web site a Huddleston too? I am a Huddleston as well. I was doing some geneology when I realized my ancestors were married in Millom Castle. I googled it and it turns out they were in charge of the place. Who owns it now? Are they any relation? The questions raised above this message have been answered on a page dedicated to the castle on the website: millomweb (https://sites.google.com/site/millomweb/castle). Further questions may be asked there. My 7th great grandfather was Sir John Huddleston. I am Deanna Huddleston from Missouri. My plans are in 2017 to visit the Castle and learn more of my family from England. My ancestor was Sir Richard Huddleston of Millom, who married Margaret Neville (illeg daughter of Richard "Kingmaker" Neville, Earl of Warwick). Thank you for posting photos of an ancestral home I will probably never get to see in person. It's a long way from Australia! I wonder how many descendants there are of the Huddlestons of Millom. Wouldn't it be awesome to know?! As per your previous note, I will be sure to credit you as the author of any photos I use in my family tree dialogue. Thank you for posting these wonderful photos of Millom Castle along with some of the information. My grandmothers was born a Huddleston and it is so nice to read about and view some of the places of history to share with my family. I to would like to add your photos to my Huddleston photos and ancestry pages and would definitely credit you and your blog post. My maiden name is Huddleston, and did some research to find out my ancestors lived in Millom Castle. I'm Carolyn from Maryland descended from William Huddleston who immigrated to Bucks County, PA in the late 1600s. It would also be a dream of mine to visit this place. My Grandfather was a Huddleston, his father's name was Alfred W. Huddlleston as was my grandfather. My Huddlestons lived and I think still do in Kansas. Like Jay H above I am also descended from the youngest daughter (Joan) of Richard Huddleston and Margaret Neville. Richard and Margaret were probably married at Millom Castle. They are my 11th Great grandparents. I think Ricard died as a result of injuries at the Battle of Bosworth. Does anyone have more specific information? I visited Millom 2 years ago but it is a private farm so could not go inside or around the ruins. However, the church is interesting.